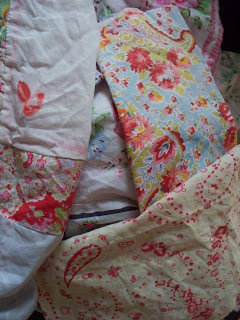 Homespun Stitchworks..... For the love of vintage: Threads of time .. .. When rummaging around my stashes of vintage threads I like to see if any will go with a current project. It is a great way to loose yourself and I have to be careful that I do not go down the rabbit hole for most of the morning! Thank you for well wishes over Mum she is doing lots better today and I am off to spend some time with her later today. I have a jar that I bought and I have filled it with little different Easter eggs for her and have her card. Through this week my sister will take her in some grapes and other goodies too. I took her in lots of daffodils that were in bud and put them in a jug in her room to say hello Spring!! I am looking forward to some rest and relaxation coming up and I have some catch up of letter writing to do and lots of little slow stitching bits to tackle as well. It will be nice to have my husband off for a few days as well, his hours and my hours plus other things we have been like ships in the night so I am excited at the prospect. Gorgeous fabrics and gorgeous threads it is something that I love and feel lucky to be able to do. It brings happiness and peace to me and I am grateful that I adore what I do. So many little things that I need to get doing to clear my mind and I have written a list which helps me see I am achieving something as I put a neat line through each task completed. all filled with brand new seeds, mealy worms, crushed peanuts and sunflower kernels. Nothing very remarkable I guess but it took a few hours. The commotion in the garden however was unreal! Where was their food? What had happened? Must alert the humans to our plight? We could starve? yes that is what was going on and top of the chorus was Miss Muddy Beak who was far from amused! Anyway yesterday they were ignoring it all but today it was too much to for them and they went back to feeding - I think they thought they were punishing us by not feeding. Today all is back to its normal mad self out there and the sun has been shining and they are indeed happy again. With the snow and the thaw plus the rain we had seed had got wet and stuck in the feeders and little tufts of grass seemed to be growing out so we actually sorted it all. As I am sat typing this to you there is light mornings and I know Summer is on its way soon there will be stitching in the garden and I am so ready for that to happen now. It seems to me it has been such a very long Winter this year. Time to beach comb and sketch down along the shore and to walk through the forest for inspiration. Well today is my last working day as I am going to take some time off for Easter. I will be back here on Tuesday 3rd of April. I hope you all have a lovely Easter and that the sun shines for us all. Although I have heard there could be some snow - I know I wanted some, but now I would like Spring, I am still cold as I am a chilly mortal but it is only just coming up for April and my darling Dad used to say to us ' Don,t cast a clout til' May is out' and I am beginning to see he was very wise in his words that he borrowed. Until the month of May is out. So all that is left to say is have a very Happy Easter whatever you are doing and enjoy your time off as well. Mum taken a turn downwards today .. very poorly with a fever too. I did all last weekend with her so my sister on duty as it were this one. It helps when there is two of you! Hope your Dad is better today. Have a lovely Easter.. I am off to cuddle my mum later. I hope you have a very Happy Easter and get some great stitching done as well. I hope today finds your Mum doing better. Enjoy the Easter season..reflecting on what it means. I can picture the chaos when spring cleaning for the birds. Love the poem..so true!